Hunter Pence #8 of the San Francisco Giants celebrates with teammates on the bench after scoring on a wild pitch by Archie Bradley #25 of the Arizona Diamondbacks during the third inning at Chase Field on September 10, 2016 in Phoenix, Arizona. Before Saturday’s game, Bruce Bochy was asked how he might get through another tight ninth inning. It was the third time in six days that he had been asked. "I’m not going to answer this question every day," Bochy said, smiling. He won’t have to on Sunday. Johnny Cueto took all the drama out of a Saturday evening game at Chase Field, throwing seven dominant innings to lead the Giants to an 11-3 blowout win. Hunter Pence handled the other side, reaching base five times and scoring four more runs to lead an offensive awakening. Through two games at Chase Field, Pence has tied the franchise record for runs (eight) in a three-game series. 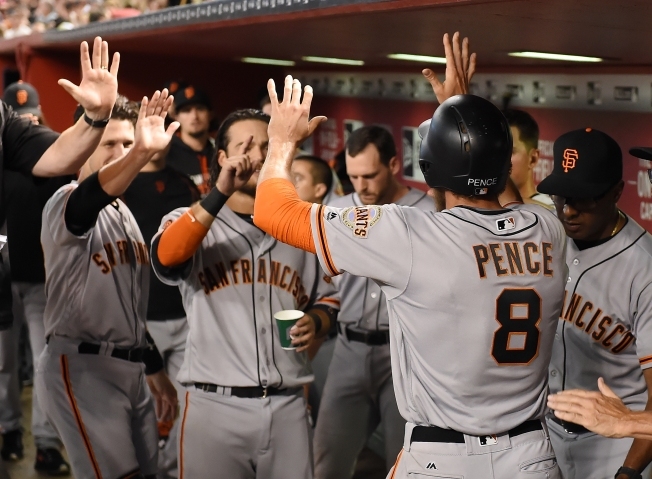 After playing one-run games throughout this trip, the Giants finally had a a breakout. Joe Panik drove in a run with a second-inning double and the Giants put up four more in the third. Buster Posey had an RBI triple and Brandon Crawford drove in a run with a double. With two outs, the Diamondbacks intentionally walked Eduardo Nuñez to load the bases for Cueto. He roped a single into right. Cueto was even better on the mound. He allowed just one hit through the first six innings, a long solo homer by Peter O’Brien that had Cueto screaming into his glove when the frame was over. Cueto’s stuff got better as the game went on, but the Diamondbacks tacked on a second run in the seventh. It wouldn’t matter. There was no giving this one back. Pence hit a solo homer in the seventh and Brandon Belt drove in two in the four-run eighth with a double that was inches from being a homer. The Giants had 19 hits, including a ninth-inning single from Denard Span that snapped an 0-for-30. Starting pitching report: Cueto finished the night at 198 1/3 innings, placing him just behind Madison Bumgarner (199 2/3). Max Scherzer is the only pitcher who has thrown more innings than the Giants’ co-aces. Bullpen report: Jake Peavy got the eighth in his first appearance since August 20. He weaved around some traffic in a scoreless frame. At the plate: Pence has seven hits and three walks in two games here. He is the first big leaguer since David Wright in 2005 to have back-to-back four-run games. In the field: Nothing of consequence. Attendance: The Diamondbacks announced a crowd of 32,301 human beings, including a guy who played a between-innings scoreboard game and for some reason announced: "I have plenty of experience drinking by a pool." Up next: Matt Moore will try to clinch a sweep. If you’re unfamiliar with the concept after this second half, that would be the Giants winning all three games of a series.